Studio 3 tem um terraço de jantar privada suspensa sobre árvores frutíferas tropicais com vista para as montanhas vulcânicas exuberantes. Todos os estúdios têm acesso ao terraço comum ostentando espectaculares vistas de 360 ​​graus e tem vista para a lagoa de Isle aux Benetiers onde você pode remar para a ilha em nossos caiaques. Rodeado pelas montanhas de Le Morne, você estará compartilhando o mesmo trecho de praia impressionante como os hotéis de luxo na fração do custo! Apenas a dez minutos de carro das praias de Património Mundial Le Morne e protegidas eo classificou lagoa número 5 em mundos top dez embarque kite e windsurf destinos .Estes estúdios contemporâneos (50M2) Eco amigável, decorado usando conceitos mínimos e tons neutros nossos estúdios têm a sensação de um hotel 4 estrelas qualidade. Um terraço comum deslumbrante com espreguiçadeira gigante & refrescar chuveiro. Grande área para churrasco jantar. Perfeito para pores do sol e os astrônomos áreas ao ar livre desta elegante propriedade foram criados com o romance no coração. Aconchegar na espreguiçadeira sob as estrelas à noite, onde morcegos voam em cima. Com 2 espaçosos estúdios no piso superior de uma casa com vistas para o mar e 2 estúdios adicionais no piso inferior com vista para um jardim tropical madura visitado por avifauna e às vezes galinhas !! Cada estúdio tem um terraço de jantar privada, onde todas as refeições podem ser tomadas fora. Privado en suite casa de banho com vaso sanitário e bidê. Toalhas de banho fornecida. Cama lençóis de algodão Super king size ortopédicos 100% alterado 1 x por semana. Cozinha privativa em cada estúdio com fogão, geladeira, freezer. De limpeza 3 x por semana [não domingo ou feriado. Wifi grátis . Cofre no quarto. Ventilador de teto. Ar condicionado disponíveis. Wir fühlten uns hier sehr wohl, denn sowohl die Vermieter Trish & Kev als auch die beiden Zimmermädchen Kathrin & Santana waren überaus freundlich und hilfsbereit. Eine kaputte Lampe auf dem Balkon wurde sofort repariert. Besonders gefreut hat uns das super eingerichtete Bad mit gut funktionierender Dusche und sogar einem Bidet. Excellent Conseils dès propriétaires, tjs disponibles et sympathiques!! Appartement vraiment sympa pour 2, cuisine pratique, terrasse pour petit déjeuner ou brunch avec ambiance tropicale et soleil! Le tout à dix minutes en voiture du spot du morne!! À refaire! This was my second stay in this studio! You won't be disappointed! My boyfriend and I spent a little over 2 months in Mauritius and while our original booking with Trish and Kev was only for a week, we ending up booking our entire stay with them. So we were lucky enough to stay in a number of their apartments, all of which are perfect for any length of stay. We stayed in this studio twice and it was a definite favorite! To start, their property is easily in the best area of the island. It’s a safe and quiet residential community. After much exploration and hearing the opinions of other guests, We wouldn’t suggest staying far from Le Morne beach. You’re a short drive to the most beautiful beaches of the island as well as a fully stocked grocery store. I will say that a car is a must though, as you’ll undoubtedly want to explore the rest of the island. Luckily you can rent a car from Trish and Kev! The apartment is simple, but lovely. Tastefully decorated with natural tones, there’s more than enough space for two. You’ve got a large closet with a safe to hold your valuables, a bathroom much larger than typical American bathrooms, and AC should you choose. We opted for the sea breeze, sleeping with our patio doors open every night. The kitchen is fully stocked with everything you need to cook yourself. If you can’t find something, just ask! Or if you prefer to eat out, there are a number of restaurants worth visiting close by. The cleaning ladies do a wonderful job of keeping the place spotless. No matter which apartment you’re in, you have a lovely private terrace for breath taking views of the sunset. For the sunrise, be sure to head up to the roof deck one morning for a full view. Dinner up there is lovely as well. Internet was a priority since we work remote. We had a few hiccups, which were addressed immediately so we were able to work without interruption. Before leaving, the town north of here was getting fiber optic cable, so surely it will be available here soon. As for activities outside of the apartment, Trish and Kev are a wonderful resource, happy to help research and book any type of excursion, from a private beach dinner to swimming with dolphins. I can’t recommend this place enough! You’ll be extremely pleased with yourself. Trish and Kev made our stay wonderful by not only being wonderful and thorough hosts, but lovely people. We hope to visit our friends again soon! This review is long overdue and that is in part due to the fact that after leaving this place, you’ll have a hard time accepting it. It’s just that lovely! My boyfriend and I spent a little over 2 months in Mauritius and while our original booking here was only for a week, we ending up booking our entire stay with them. So we were lucky enough to stay in a number of their apartments, all of which are perfect for any length of stay. The apartment is simple, but lovely. Tastefully decorated with natural tones, there’s more than enough space for two. You’ve got a large closet with a safe to hold your valuables, a bathroom much larger than typical American bathrooms, and AC should you choose. We opted for the sea breeze, sleeping with our patio doors open every night. The kitchen is fully stocked with everything you need to cook yourself. If you can’t find something, just ask! Or if you prefer to eat out, there are a number of restaurants worth visiting close by. The cleaning ladies do a wonderful job of keeping the place spotless. No matter which apartment you’re in, you have a lovely private terrace for breath taking views of the sunset (Studio 3 was my favorite!). For the sunrise, be sure to head up to the roof deck one morning for a full view. Dinner up there is lovely as well. Internet was a priority since we work remote. We had a few hiccups, which were addressed immediately so we were able to work without interruption. Before leaving, the town just north of here was getting fiber optic cable, so surely it will be available here soon. As for activities outside of the apartment, Trish and Kev are a wonderful resource, happy to help research and book any type of excursion, from a private beach dinner to swimming with dolphins. I can’t recommend this place enough! Trish and Kev made our stay wonderful by not only being wonderful and thorough hosts, but lovely people. We hope to visit our friends again soon! During our Mauritius holidays, we didn't want to be surrounded by too many tourists and were looking for a more authentic experience in beautiful natural surroundings. And that's exactly what we got a Beautique Studios. 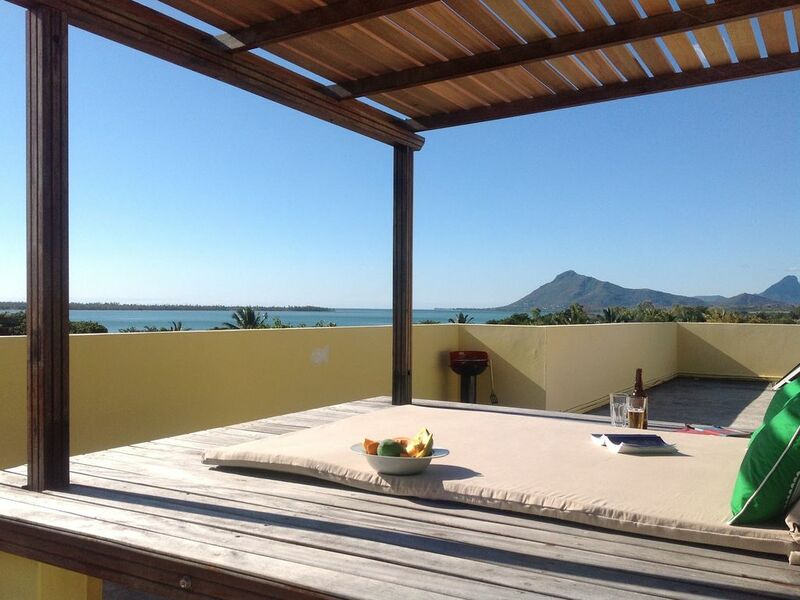 The apartments are situated in Cotaeu Raffin, where you can watch Mauritian village life go by. The rooms are very spacious and uncluttered, something we came to appreciate very much. Every second day there is a cleaning service, which makes for very comfortable holidays and the Wifi connection is excellent. But what really made our stay was the people - Trish and Kevin are wonderful hosts. They really make you feel at home and help in any way they can. They also just got brand new kayaks delivered and we had a lovely paddle out to Ile aux Benetiers (although my arms thought otherwise). We rented a very reliable little car from Victor who is also a wealth of information and is by your side whenever needed. All in all a home away from home. Oh yes, and the roof top terrace - nothing better than sipping your coffee there in the morning and enjoying the million dollar view! The beach at Le Morne Brabant is 5-10 min drive away and we can honestly say for us it is the best beach on the island. I would come back to Mauritius for that beach alone. You snorkel out for 30 meters and you feel like you are in an aquarium. The natural landscape in that area (south west in Mauritus) was for us also the most beautiful on the whole island with tropical forests and only a few kilometers away from the mountainous Chamarel area. Thanks Trish and Kevin and Victor - we will be back! We are so grateful for that kind review. We feel the same way about this amazing location. Thanks for taking a moment to write a review. It motivates us and let's us know we are doing a good job. Please come back and see us again someday.